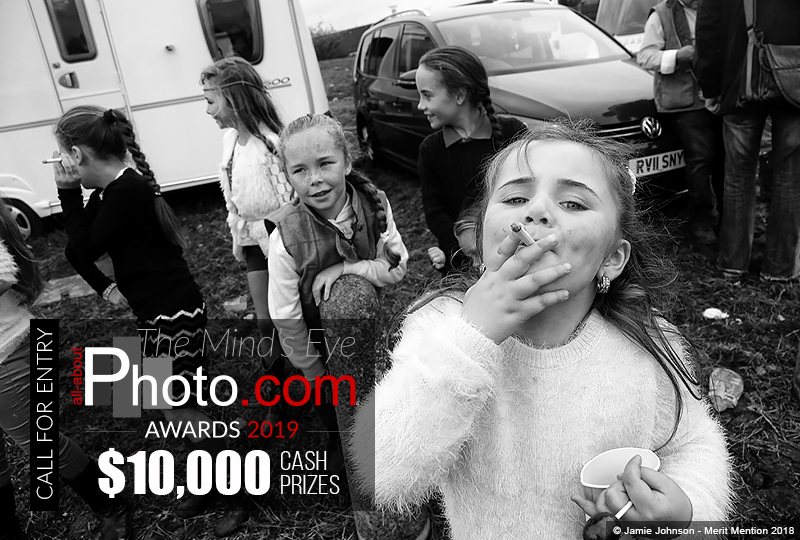 All About Photo invites photographers from around the world to enter the “All About Photo Awards 2019, The Mind’s Eye”. In reference to Henri Cartier-Bresson’s photo essay, The Mind’s Eye competition which is in it’s 4th year, investigates the depth and thoughts behind each image. Five winners will receive $10,000 in cash awards, extensive press coverage and global recognition. All winners will have their work published/showcased on the websites Dodho Magazine, Be-Art Magazine, Daylighted, All About Photo Winners Gallery and featured in the printed issue of AAP Magazine “Special Edition All About Photo Awards 2019”. In addition, a selection of entrants of particular merit will be invited to display their portfolio on All About Photo. The photographs will be evaluated by a panel of world-renowned jurors composed of 10 photographers and industry professionals:John Rankin, Elisabeth Avedon, Henry Horenstein, Laura Geiser, Alex Cammarano, Anna Van Lenten, Tariq Zaidi, Ann Jastrab, Maxim Panés and Sandrine Hermand-Grisel. Eligible contestants can visit www.all-about-photo.com to submit photographs. The contest will accept photo submissionsfrom November 1, 2018 to January 31, 2019, at 12 p.m. EST (U.S.). Entries must be in digital format and must be submitted electronically. Winners will receive $10,000 in cash awards, extensive press coverage and global recognition. The grand prize is $5,000, the 2ndprize is $2,000, the 3rd prize is $1,500, the 4th prize is $1,000 and the 5th prize is $500! All winners will have their work published/showcased on the website Dodho Magazine, Be-Art Magazine, Daylighted, All About Photo Winners Gallery and AAP Magazine “Special Edition All About Photo Awards 2019”. In addition, a selection of entrants of particular merit will be invited to display their portfolio on the website www.all-about-photo.com based on originality, technical excellence and artistic merit. John Rankin: Photographer, Publisher and Film Director. Elisabeth Avedon: Photography book and exhibition designer, independent curator and writer.Henry Horenstein: Photographer, Professor of photography at RISD. Laura Geiser: Senior Photo Editor, Buzz Feed News. Alex Cammarano: Founder and CEO of Daylighted. Anna Van Lenten: Founder & director at LightField, curator at Half King Photo Series. Tariq Zaidi: Photographer, Winner All About Photo Awards 2018. Ann Jastrab: Editor-in-Chief, All About Photo, Curator, Writer & Educator. Maxim Panés: Founder & Director Dodho Magazine. Sandrine Hermand-Grisel: Photographer, Founder & Editor All About Photo. Competition opens: November 1, 2018. Competitions closes: January 31, 2019. Judging process starts: February 8, 2019. Judging process ends: March 31, 2019. Winners will be notified by email around April 1, 2019. Winning images will be available online at www.all-about-photo.com after April 1, 2019. The competition is open to all genres and subject matter will be considered. All types of photography, from digital to analog to alternative processes and beyond are encouraged to enter. All works must be original. $5 for each additional image. Up to 50 images.